There are often astronomical objects that cannot really be seen properly. They glimmer weakly in the eyepiece, somewhere between the visible and the invisible. But then you play your trump card - your UHC filter. Suddenly, you can see the nebula clearly and vividly. Is it magic? No, it is simply technology! 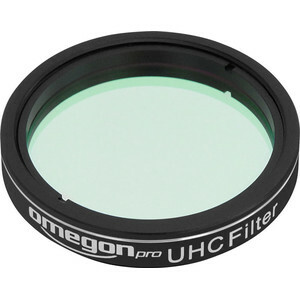 The UHC filter is generally useful for visual observing of emission nebulae, planetary nebulae and supernova remnants. 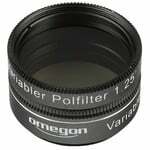 So it is the right filter if you are a deep sky fan, but do not yet possess a filter. You will be amazed how much detail you can suddenly see - and not only with dim objects, but also with bright ones. The Orion Nebula, for example, is larger than you might think. The UHC filter lets you see even more of the nebula and its structure. You could easily observe for hours, exploring everything. How the filter achieves such enormous contrast. Or: Why you do not have to go to the Atacama Desert. 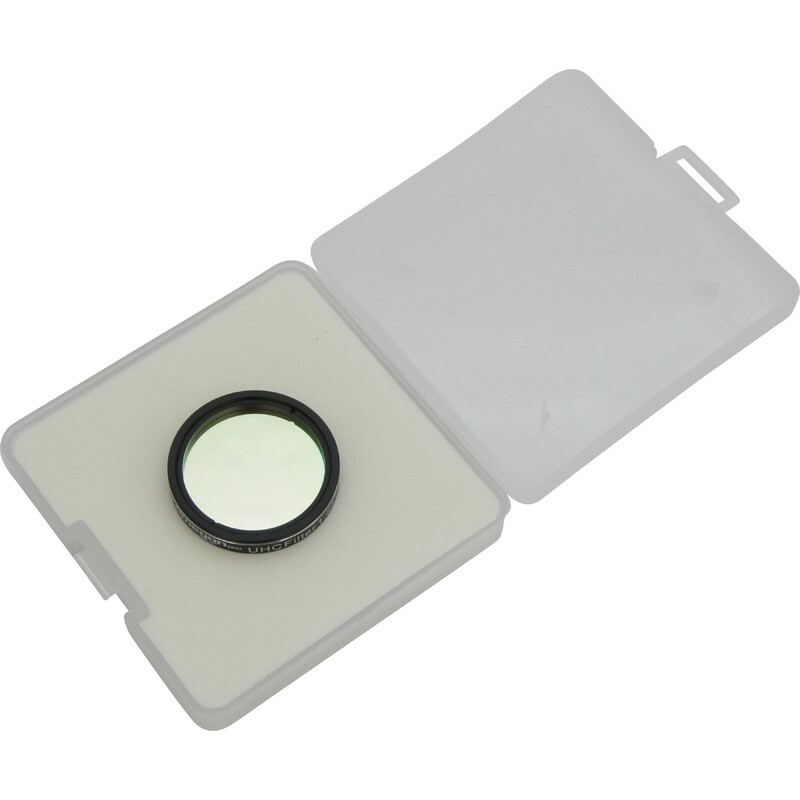 An interference filter, such as this one, achieves its excellent results by blocking most wavelengths and only letting certain specific wavelengths through. The artificial lighting - the 'sky glow' - of cities is blocked, while the light in which nebulae radiate is allowed through. The stars appear dimmer, but nebulae become much more distinct. 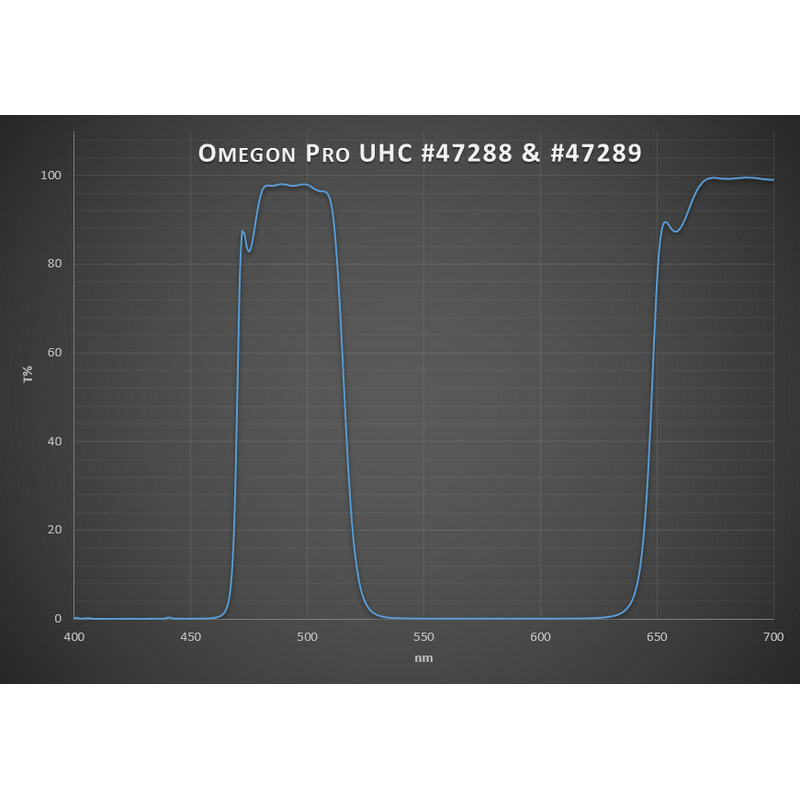 More specifically, the Omegon UHC filter allows the green wavelengths at 496nm and 401nm, which make up the OIII emission lines, through. 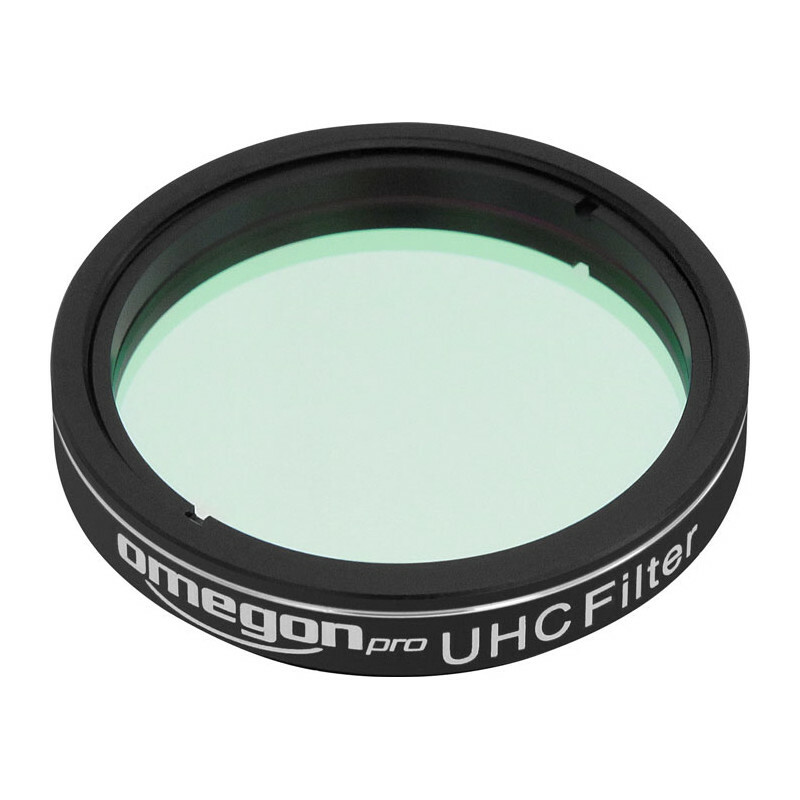 The Omegon pro UHC filter lets you into the 'ground floor' of nebula observing. 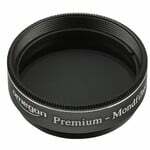 It increases the contrast with nearly all nebulae. And you can even use it with smaller telescopes of 100mm aperture, as it darkens the image only slightly. 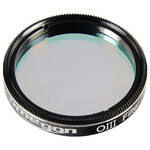 One advantage is that each Omegon pro nebula filter is tested in advance and comes equipped with its own test certificate. 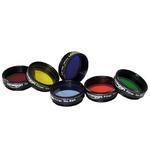 Every filter is tested before being sent out. 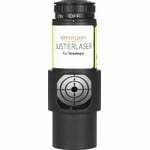 You will also receive an individual test report confirming the quality of your filter.